Is an ignition amplifier worth the expense? The million dollar question. Will it cure ignition "breakup" caused by a degraded stock system. By most accounts it will. 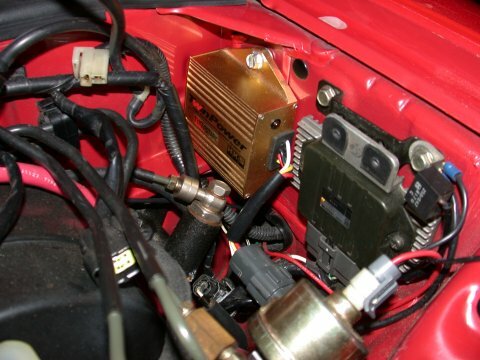 But for a fully functional stock ignition system just how much will this little gold box gain you in the HP department and is it worth the cost? I'm skeptical, I'll admit to that. So why do I have one? Well because the price was right and I like spending money on my car. Yup...that's it. And I'll be frank, have I noticed an improvement in performance? Not really. But there is a stong likelihood, based on some of the testimonials I've read, that it will yield a few more HP if tested on a dyno. 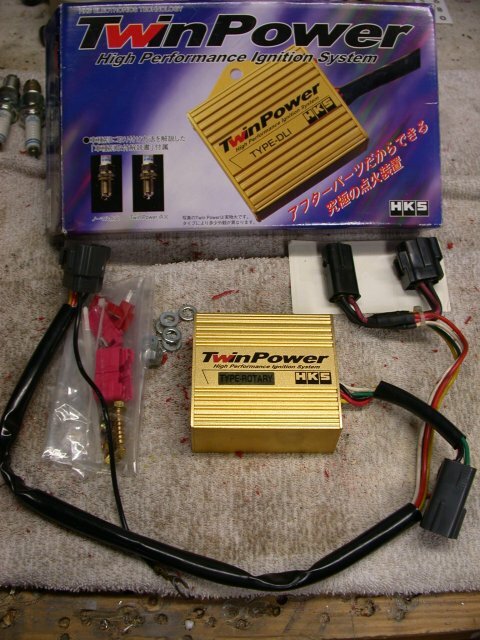 HKS offers the following: "HKS offers an excellent ignition amplifier for the 93 - 95 RX-7's. 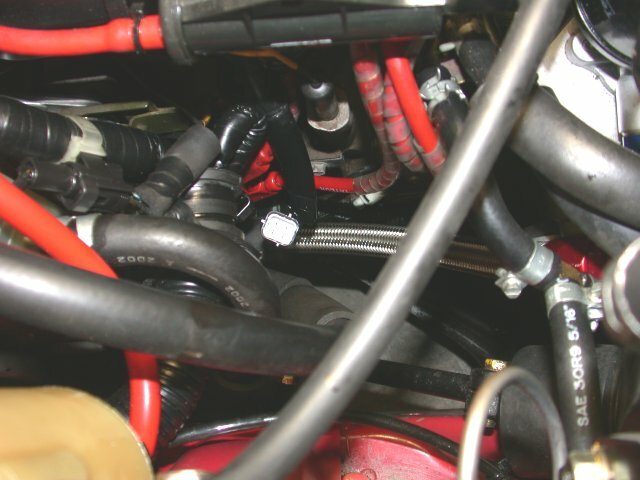 This unit is a direct "bolt-in" to the stock wiring harness. This box is not like the other ignition amps, that only charges leading plugs. The HKS unit will offer an improved spark for all leading and trailing plugs. By enhancing the spark, more horsepower is achieved. The further modified a car is, the more horsepower the HKS Twin Power will provide. So is it snake oil? Smoke and mirrors? A way to get you spend a pretty big chunk of money? I dunno. I got my TwinPower used, but lightly used, and for a fair price reduction so I deemed it worth the expense. The white 4 pin plug dead center. 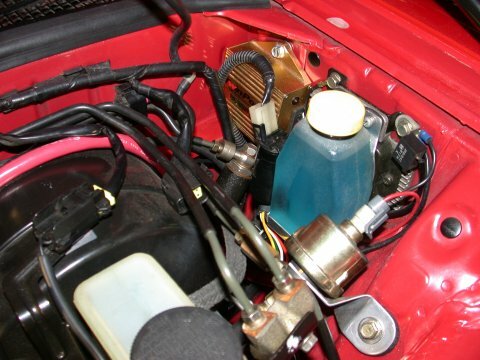 The harness is long enough to allow mounting of the ignition box itself an a fair number of locations. On my car things are a little cramped in that area already with the fuel pressure sensor and the mini-washer fluid reservior. The best place I found to mount the box was tucked away in the corner next to the firewall. There is only one mounting tab on the ignition box so one screw will have to suffice. I drilled a hole in the fender, sealed it with some silicone to prevent corrosion, and used a big sheet metal screw. Pretty archaeic eh? But it worked. I stuck some rubber feet on the back of the box to stop the ignition box from rattling against the fender and to cushion it from vibration and shocks. Other than that there really wasn't anything to it. Plugged in the car started right up with no issues, the little green ligth ont he box letting me know that the unit is on and working.